A couple of years after my first tim in Designboom with “A Dolphin for Damien” (part of my “Landscape Under Construction” work) I am back in their “virtual” pages with part of my current work “PreFabricated Lifes“. These photograhs were taken during two trips to the Empty City, and in fact were intended to be a part of “Rooms of solitude” but somehow they have managed to become independent. 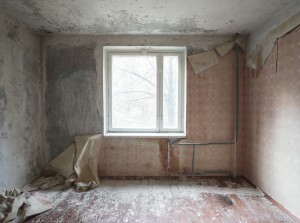 The Empty City was created as an state of the art town, was abandoned in 1986 and no one has inhabited its prefabricated buildings since them. Now floors bend, paint craks and painted papers fall at random showing at the same time the minimal decoration of the families that lived there. So, even the most alienating of the systems has been unable to make human beings equal to each other. Vuelvo a las páginas virtuales de Designboom con mi trabajo más reciente “PreFabricated Lifes“. Hace un par de años publicaron el artículo “A Dolphin for Damien“, parte de mi trabajo “Landscape Under Construction“. Estas útimas fotografias, tomadas durante mis dos viajes a la Ciudad Vacía, iban a ser una parte de mi serie “Rooms of Solitude” pero lo cierto es que se han convertido en un trabajo independiente. La ciudad vacía fue concebida y construída como ejemplo de modernidad. Abandonada en 1986 nadie ha habitados sus edificios prefabricados desde entonces. Ahora los suelos se abomban, la pintura se quiebra y el papel pintado se cae de las paredes por el efecto aleatorio del tiempo, mostrando a la vez la mínima decoración hecha por sus moradores. Así queda demostrado que ni siquiera el más alienante y antinatural de los sistemas pol´ticos puede hacernos a los humanos idénticos entre nosotros.